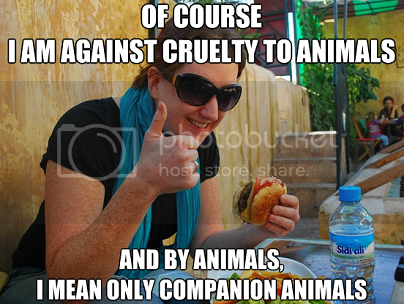 While I completely agree with this, I also have sympathy for people who REALLY DO love animals but for many reasons may need to eat some meat. I feed meat to my dogs, and that brings into question the very idea of keeping carnivorous companions, if you think of it that way. On the other hand, perhaps it is not so much the taking of life to feed life - you may have noticed, Drumwolf, that is what happens? but how we go about it. I deplore and despise factory farms, but does not the wolf hunt the deer and the bobcat take down the hare? I prefer not to eat meat myself, and I'm irked to no end by those who do so and gloat about it, but I also am a realist; if an animal lives and dies with respect and love, gratitude and care, it strikes me as a different thing from the "horrors of the abattoir". But yes, I do believe if more people tuned in to the suffering on their dinner plates, the world would be a better place. On the other hand, perhaps it is not so much the taking of life to feed life - you may have noticed, Drumwolf, that is what happens? but how we go about it. I deplore and despise factory farms, but does not the wolf hunt the deer and the bobcat take down the hare? I agree that eating other organisms is part of the ecology of any environment, but the quote referred specifically to reared animals. The obscenity that is industrial farming and the appalling conditions endured by the animals is the crux of the quote. I prefer not to eat meat myself, and I'm irked to no end by those who do so and gloat about it, but I also am a realist; if an animal lives and dies with respect and love, gratitude and care, it strikes me as a different thing from the "horrors of the abattoir". If I think about things very much, I simply cannot eat anything. Not only do I think of the suffering of the animals but of the plants on my plate. AND all the GMO, chemicals and other goodies that are IN the meats and plants! I have been steady losing weight over the last year and this is the only reason we can find - the idea of eating anything is getting to be an issue for me. So my "solution" is to offer prayers of gratitude for their sacrifice and offer my sorrow for their suffering in order to feed me. I'm going off meat again, because I feel a souldeep and physical need to. but I think that those who still eat it, if they support humane practises and eat mindfully, are making a difference as well.